Herbie Fletcher "1995 Local Hero"
Herbie began surfing at the age of 10. Thirty-six years later, he's still surfing hard at Pipeline or some remote island. His high energy and exuberance for adventure have spilled over into his business success. As owner of Astrodeck (and several surfing and snowboard clothing line), he has afforded surfers the "firm foothold" to perform extreme acrobatic maneuvers. 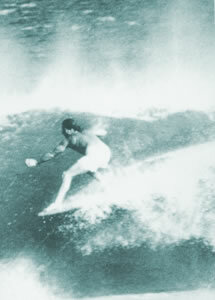 When he was only a teen, he gave chase to some of the most, respected names in surfing, particularly David Nuuhiwa. Herbie fulfilled his fantasy of moving to Hawaii when he was 15. The kid rode BIG wave...so well that Hobie Alter and Bruce Brown paid him to surf and then appear at local malls to talk about it. In 1966, still just 17, he placed 7th in the World Championships. During the introduction of shortboards, Herbie's shaping talents had a lot to do with design elements still in use today (like down rails). Herbie saw his first jet ski in 1975 and figured it was just a motorized surfboard...excelling at challenging big waves even when Wiamea closed out. His sons, Christian and Nathan, are both champion surfers. Herbie's philosophy on life is simple, "Don't stop. Don't look back." With the exception, he still loves coming back to Huntington to shoot the pier.